Hello, I’m Dr. William Pawluk. I’m a medical doctor and I’m going to introduce you today to my new book, Power Tools for Health. How can pulsed electromagnetic therapy help me? Healing doesn’t have to be left to chance anymore. Relieve pain and inflammation, speed recovery from injuries, stimulate stem cells, improve circulation, and help with sleep and mood. Recover from injuries and surgery in about half the time, I did! Improve sports performance, increase energy, heal just about any tissue in the body. Learn how a three-year-old child regrew her thumb, learn how a diabetic saved his legs. Back pain, knee pain, shoulder pain, elbow pain, foot pain, headaches. Almost any pain in the body is helped by this therapy, almost all organs and cells in the body benefit from this therapy this book explains how this revolutionary European technology can help you in the home right now. You can take your own care into your own hands, so you don’t have to rely on going to practitioners for ongoing care, which often provides only short-term benefits. Most problems in the body never sleep and this therapy can be used around the clock to help keep up with the ongoing background causes of health problems. It is an all around first aid kit and it’s available to everybody in the house to use; including babies and pets! Of all the different technologies I have used over 45 years of medical practice for health and healing this one has the most value for the cost and is easy to use. If you want to know more about how you can take your own health into your own hands at home today safely and without surgery order your own copy of Power Tools for Health today! 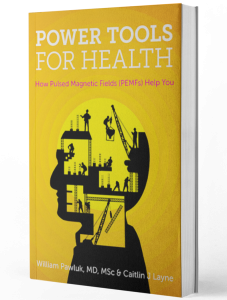 Where can I order my copy of Power Tools for Health: How PEMFs help you? Visit my website at www.drpawluk.com or look for us on Amazon.com as well to order your print or digital version of the book today and begin your journey to better health! Ignore the rumors and get into the real science with William Pawluk, MD and Caitlin Layne.